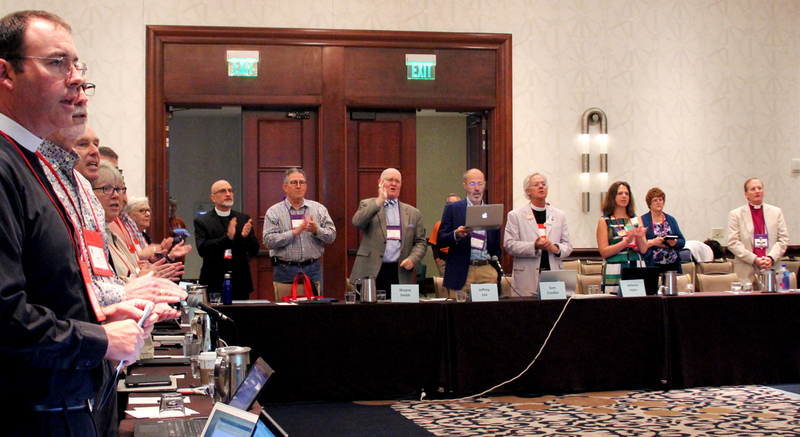 The Committee to Receive the Report of Resolution A169, which is considering resolutions to revise of the Book of Common Prayer, on July 5 voted to propose to General Convention a plan for comprehensive revision of the current 1979 prayer book. The resolution, which will be an amendment to Resolution A068, authorizes the start of a revision process that could culminate in a new prayer book in 2030. The resolution was developed by a subcommittee appointed on July 4 to incorporate the process of revision specified in Resolution A068 and incorporating calls for inclusive and expansive language, for God and human beings, which was presented during hearings, also on July 4. Exempted from the inclusive language revision will be Holy Eucharist Rite 1 and the church’s historical documents printed in the prayer book. In a split between the deputies and bishops, who meet together but vote separately, exempting the Lord’s Prayer from revision was adopted by the bishops but rejected by deputies. That means that the deputies’ version will be presented to the House of Deputies when the matter is taken up in a special order of business on July 6 at 4 p.m. If adopted there with that clause intact, the bishops’ version will be debated in the House of Bishops. Reconciliation then would be needed between the two versions. This resolution carries through the background materials associated with the original A068, which describes a 12-year process of prayer book revision. This includes a comprehensive survey of the liturgies in use in congregations, consultation with other provinces of the Anglican Communion, drafting committees and an overall editor. The plan is to gather data over the next three years, with a complete revision by 2024. That proposed book would undergo three years of trial use throughout the Episcopal Church, with a first vote by General Convention in 2027. Because revision of the prayer book is part of the church’s Constitution, adoption of a new book requires votes in two consecutive General Conventions to take effect, placing final approval on the agenda in 2030.